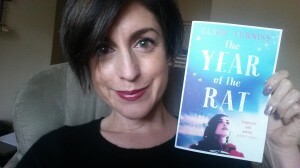 This week I had a very exciting early Christmas present – the brand new paperback of The Year of The Rat! It’s not in the shops till January but I got a sneak preview and I love the new look. It gave me a real boost as I’m currently immersed in the tricky business of writing my next book – ‘The Difficult Second Book’ as many authors fondly refer to it. I love writing, and feel incredibly lucky to do it for a living, but that doesn’t mean it’s always easy. When I’ve had a really hard day of forcing the words onto the page, and then deleted more of them than I’ve kept, I’m reminded of a Thomas Mann quote: “A writer is someone for whom writing is more difficult than it is for other people.” It certainly often feels that way! I love the story I’m writing now (and I’ll be talking more about that very soon) but there are definitely days when it feels impossible to imagine it ever being the book I want it to be. So it was great to be reminded that I felt exactly the same when I was writing The Year of The Rat, and to remember just how exciting it is to hold a beautiful new book with your name on it in your hand!